Whether you have a small or large lawn, the benefits of artificial grass are becoming more and more apparent. Water conservation is certainly the most talked about benefit to artificial grass, but there are many upsides to choosing to not go sod or seed. Your backyard is more than just the patio furniture you choose! Landscaping is a key part of the visual experience. Here are three extra perks that come with adding artificial grass to your outdoor landscape. Everyone who has a well-maintained outdoor space knows the struggle of keeping it looking great. With artificial grass, your lawn looks fantastic year-round. No longer will you struggle with brown spots due to a broken sprinkler head. Pests and rodents are averted with artificial grass too, so no more mounds of dirt caused by moles creating eyesores out of your lawn. The look of lush green grass is possible during the dog days of summer and you can avoid a muddy mess in the wet winter months. Low maintenance goes beyond watering. Artificial grass does not require fertilizer, pesticides, or gas-powered tools to thrive. That means no Sunday morning mowing of the lawn or fertilizing to encourage grass growth. Artificial grass maintains it’s perfection with little to no work on your part. With a quick sweep of a broom, lawn chores are done for the day. 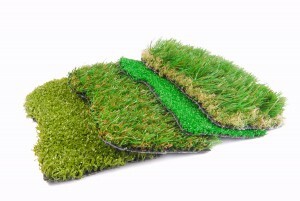 Artificial grass is eco-friendly in more ways than just water conservation. You are also not using gas or electric powered maintenance tools for upkeep. In addition, artificial grass never needs toxic chemicals to protect its health. The chemicals needed to maintain a sod or seed lawn are dangerous for kids and animals, who often come into direct contact. These chemicals also contaminate runoff water systems and have a negative impact on the environment. When it is time to replace artificial grass it is less expensive and easier than replacing seed or sod grass. If the artificial grass you are replacing still has a little life left it can be recycled into a soft area for a dog in a dog run or creating a weed-free garden. If you are interested in saving money, time, and water, artificial grass might be a great choice for you. Saving all of those things and keeping a green lush environment year-round is just an added bonus to going artificial lawn.